Breaking assassin Jonathon Decker out of a maximum-security prison on Trakis One seemed like a good idea at the time. Now, pursued across space by the two most powerful factions in the universe, the crew of El Cazador are having second thoughts. They'd like to give him back. Unfortunately, that is no longer an option. Jon is used to working alone. Now, he's stuck on the space cruiser El Cazador until he can work out just what he's supposed to know that puts him on everybody's most-wanted-dead list. He's not happy that the crew includes a runaway priestess with designs on his virtue-such as it is. Jon likes women, but he gave up the role of protector a long time ago, and Alexia, High Priestess of the Church of Everlasting Life, is an accident waiting to happen. After twenty-four excruciatingly boring years of doing her duty, Alex is finally having some fun. She never meant to run away-it was a rash impulse-and she means to go back-eventually. But first, she's going to squeeze enough excitement out of the situation to last her a lifetime. 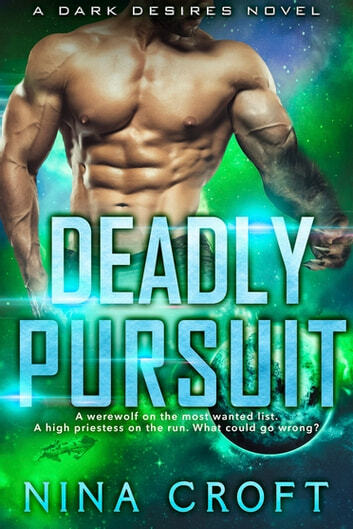 And what could be more exciting than a stunningly gorgeous werewolf? Meanwhile, the Church are chasing their missing priestess, and the Collective are pursuing their escaped assassin. Being hunted has never been more deadly...or more fun.